To Cite: Afshar Payam M, Rasooli I, Owlia P, Talei D, Darvish Alipour Astaneh S, et al. Correlation of Virulence Factors and Cell Adhesion of Clinical Isolates of Acinetobacter baumannii, Arch Clin Infect Dis. 2018 ; 13(3):e62841. doi: 10.5812/archcid.62841. Background: Adhesion to host cells is an important and critical feature of Acinetobacter baumannii pathogenesis. OmpA, ABAYE1319-CsuA/b, and ABAYE2132 are highly prevalent and conserved fimbrial proteins; ABAYE1859 and ABAYE0304 fimbrial antigens are the factors described as novel vaccine candidates against multidrug-resistant (MDR) A. baumannii. Methods: The current study aimed at investigating the significance of A. baumannii fimbrial and outer membrane proteins A (OmpA) in adherence to human epithelial cells. Antibiotic resistance was determined by the broth microdilution method. Phenotypic identification of isolates producing ESBL (extended-spectrum beta-lactamase) was conducted using double-disc synergy test (DDST). The virulence factors were detected by the polymerase chain reaction (PCR) in 100 non duplicate clinical isolates of A. baumannii; 18 clinical isolates were selected for adhesion assay based on antibiotic resistance and PCR results. Results: The current study results showed that ABAYE2132, ABAYE0304, and ABAYE1319- CsuA/B had significant correlation with cell adhesion (P ≤ 0.05). There was no significant correlation between cell adhesion and ABAYE1859 (P ≥ 0.05). ABAYE2132 was the most effective factor in cell adhesion. It was also observed that cell adhesion rate reduced with the increase of fimbrial proteins. Conclusions: The current study findings suggested that different products and structures of A. baumannii, most still unknown, play a pivotal role in pathogen-biotic reactions. Better exposure of some non-pili adhesins or other biofilm forming factors could be a reason for this phenomenon. Interaction of pathogen and host cell is critical in the pathogenesis of some microorganisms leading to their internalization (1, 2). In order to establish infections, bacteria should colonize the host. Attachment of pathogens to host cells is promoted by expression of various molecules or structures by bacterial cells. The adhesion depends on interactions of the receptors and host cell surface or soluble proteins playing a bridge role between bacteria and host cells (3). Microbial adherence to host cells as the initial step of the colonization process is an important virulence factor (4). Acinetobacter baumannii, recently emerged globally as an important nosocomial pathogen (5). Most of the strains are multidrug-resistant (MDR) with the ability to survive in the hospital environment and spread among patients (6-8). A. baumannii strains cause pneumonia, bacteremia, meningitis, and wound and urinary tract infections (7, 9). In order to determine the outcome of infections more attention should be paid to the interaction between A. baumannii and the host epithelial cells (4, 10). The adherence potential of A. baumannii to human bronchial epithelial cells and its resistance to major antimicrobial agents explain its survival in the medical environment and the human host (11). A few molecular factors are required for A. baumannii virulence in humans. They include mainly Bap (biofilm-associated protein), OmpA (outer membrane protein A), phospholipase D, the Csu (chaperone-usher type pilus), the Acinetobacter trimeric autotransporter (Ata), and the acinetobactin-mediated iron acquisition system (12). Epidemiological studies established the colonization and persistence of Acinetobacter species on human skin and mucosal membranes for days to weeks implying the ability of these microorganisms to adhere well to such surfaces (13, 14). A. baumannii adherence to host cells is mediated by fimbria or OmpA (1, 15). The exact mechanism of adherence of clinical A. baumannii isolates to various biotic or abiotic surfaces is not understood so far suggesting the possession of various independent molecular mechanisms for adherence to such surfaces by A. baumannii (16). It is reported that pili play an important role in twitching motility as well as adhesion and biofilm formation (17). Acinetobacter strains may construct more than one form of pili at time (18). Tomaras et al. (19), demonstrated pili formation ability of A. baumannii strain ATCC19606T and subsequently the bacterial adherence to abiotic surfaces via biofilm formation. This ability depends on the expression of a part of CsuA/BABCDE chaperone-usher pili assembly system known as CsuE. OmpA is the most prevalent surface protein in A. baumannii with 38 kDa molecular weight. This protein, associated with the permeability of small solutes, is responsible for adherence and subsequent invasion of A. baumannii in epithelial cells (15). In vitro adherence to epithelial cells is a useful study model to investigate the adhering capacity of microorganisms. There are only a few reports (1, 4, 9, 20) of in vitro adherence to epithelial cells by Acinetobacter species. Due to the limited number of effective antibiotics against MDR A. baumannii infections, the surface antigens could serve in the development of broadly protective vaccines (21). The current study aimed at investigating the correlation of virulence factors of clinical isolates of Acinetobacter baumannii and their ability to adhere bronchial epithelial cells and their adherence correlation with the virulence factors of clinical A. baumannii isolates through an in vitro bacterial adhesion assay. A. baumannii ATCC 19606 was used as standard strain and 100 clinical isolates were obtained from patients of Khatamolanbia hospital, Tehran, Iran in 2014. A. baumannii isolates were identified using standard biochemical and microbiological tests and confirmed by PCR amplification of 16S-23S ribosomal DNA intergenic spacer region (22). The PCR using a pair of primers, PR-Ab-ITS (5’-TCTAAATTCACATACCAAAACGC-3’) and PF-Ab-ITS (5’-ACGGTAATTAGTGTGATCTGACG-3’), specifically amplified an internal 166-bp fragment of the 16S-23S ribosomal DNA intergenic spacer region of A. baumannii. PCR reaction was performed in a 25 μL total reaction mixture. Each reaction contained 0.4 μm of each primer, 200 μM of each dATP, dCTP, and dGTP, 190 μM dTTP, 10 μM DIG-11-dUTP (Roche Diagnostics), 0.5 U of Taq DNA polymerase, 2.5 μL 10X buffer, 2 mM MgCl2, and different concentrations of genomic DNA. PCR cyclic conditions were initiated with 95°C for three minutes followed by 35 cycles of 94°C for 45 seconds, 60°C for 40 seconds, 72°C for one minute, and a final extension at 72°C for five minutes. Finally, the PCR product was electrophoresed by 1% agarose gel. OmpA, ABAYE1319- CsuA/b, fimbrial protein, and ABAYE2132-fimbrial protein (Group I), ABAYE1859-fimbrial protein (Group II), and ABAYE0304-fimbrial protein (Group III) were selected. 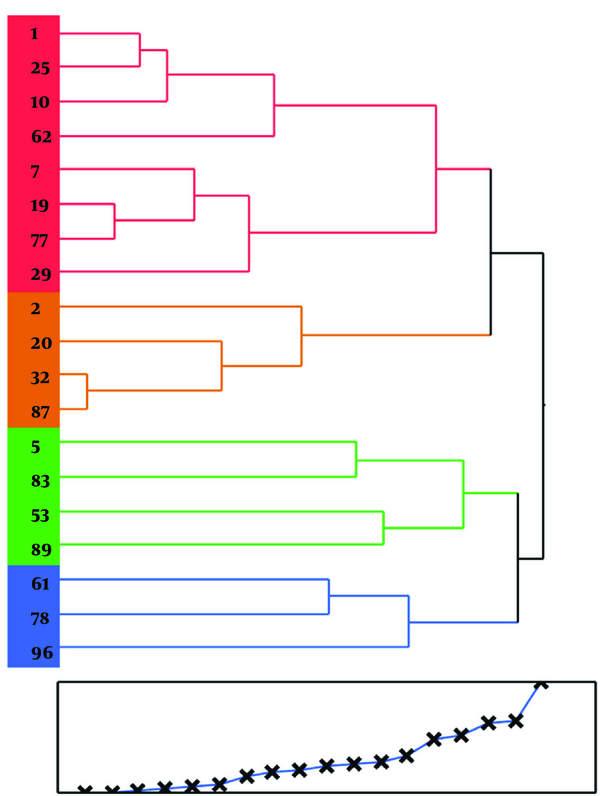 Based on the prevalence and amino acid sequence conservation, the antigens were divided into three groups including highly prevalent and conserved antigens (Group I), highly prevalent and variable antigens (Group II), and low prevalent (Group III) (21). Colony PCR, using the primers listed in Table 1, was performed with 20 μL of master mix containing 5 U/μL Taq polymerase (0.2 μL), 10X PCR buffer (2 μL), 50 mM MgCl2 (2 μL), 10 pM reverse and forward primers (1 μL each), and 1 μL of dNTPs MIX (2 mM) in 9 μL of distilled water. Minimum inhibitory concentrations (MICs) were determined using broth microdilution method, based on the clinical and laboratory standards institute (CLSI) guidelines, in Mueller-Hinton broth (Merck, Germany) in 96-well plates with a serial dilution of antimicrobial agents ranging from 0.5 to 256 mg/L (23). The lowest dilution at which bacteria failed to grow was regarded as MIC value. A. baumannii isolates were tested against cefepime, ceftazidime, ceftriaxone, imipenem, meropenem, and gentamycin. A. baumannii ATCC19606 served as quality control (24). Phenotypic identification of ESBL producing isolates was carried out with double-disc synergy test (DDST) screening method. The employed antibiogram disks included ceftazidime (30 μg), cefotaxime (30 μg), ceftazidime-clavulanic acid (30/10 μg), and cefotaxime-clavulanic (30/10 μg). The Muller-Hinton agar (Merck, Germany) was used to place pairs of disks at 20 mm distance from each other. The P5 mm and growth inhibitory zone of ceftazidime-clavulanic acid and cefotaxime-clavulanic than ceftazidime and cefotaxime was regarded as an ESBLs producing isolate (25). SPSS version 21.0 was used for data analysis. Student t test was used to determine differences between means. Adherence data were compared employing the Mann-Whitney-Wilcoxon test. Correlations of adhesion and increased virulence factor were evaluated by general linear model analysis (multiple linear regression). P values < 0.05 were taken as statistically significant. A. baumannii isolates were confirmed by PCR amplification of 16S-23S ribosomal DNA intergenic spacer region. 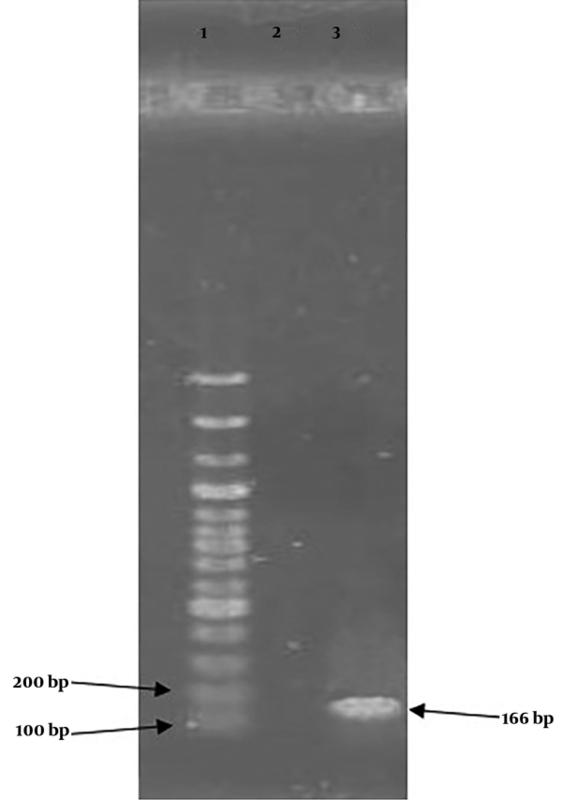 As shown in Figure 1, PCR led to specific amplification of an internal 166-bp fragment of A. baumannii isolates. Figure 1. Identification of bacterial isolates by PCR. Lane1: A 100-bp DNA ladder; Lane2: Negative control; Lane3: A. baumannii genomic DNA containing 16S-23S IGS (166 bp). 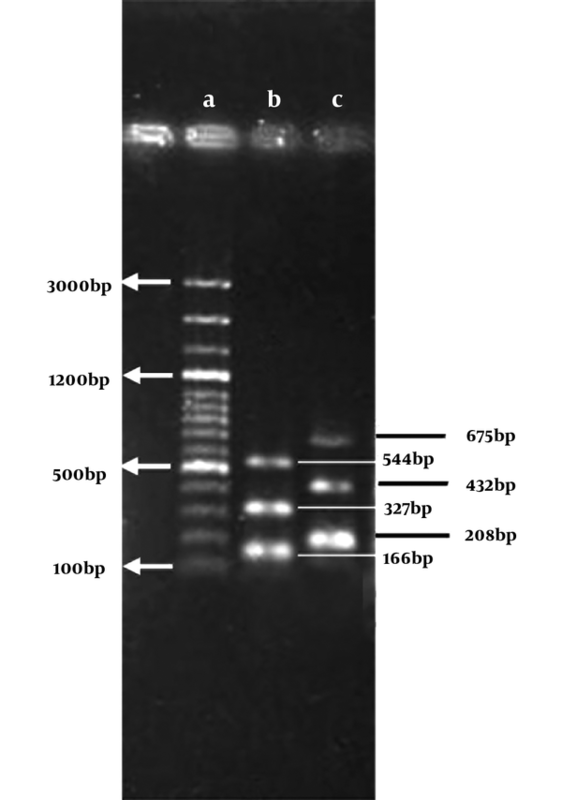 The presence of ompA gene, as well as ABAYE1319, ABAYE2132, ABAYE1859, and ABAYE0304 (encoding fimbrial protein) was investigated by PCR (Figure 2). All the clinical A. baumannii isolates harbored ompA gene. Frequencies of the genes among 100 A. baumannii isolates were as follows: ABAYE2132 (88%), ABAYE1319 (84%), ABAYE1859 (51%), and ABAYE0304 (48%) (Table 2). The antimicrobial susceptibility test revealed that 100% (n = 18) of the isolates were resistant to gentamicin, ceftriaxone, and ceftazidime. The resistance rates to cefepime and imipenem were 83.3% (n = 15) and 77.7% (n = 14), respectively. However, 22.2% (n = 4) of the isolates were susceptible to meropenem (MIC ≤ 4 μg/mL) as determined by the broth microdilution method. There was no significant correlation between virulence factors and the antibiotic resistance. Based on PCR results, 18 clinical A. baumannii isolates with one to four virulence factors were selected for antimicrobial susceptibility and adhesion tests (Table 3). Phenotypic identification of ESBL producing isolates revealed that 11 (61%) isolates could produce ESBL enzymes. There was no significant correlation between virulence factors and ESBL producing isolates. All the 18 isolates attached to the A549 cells. The number of adhered bacteria varied from 35.6 × 104 to 447 × 104 CFU/mL (Figure 3). ABAYE2132, ABAYE0304, and ABAYE1319 had significant (P < 0.05) correlation with cell adhesion. Dispersion of virulence factors and their relevance to various strains of A. baumannii are illustrated in Figure 4. There was no significant correlation between cell adhesion and ABAYE1859 (P ≥ 0.05). ABAYE2132 was the most effective factor in cell adhesion. Henrichsen and Blom (28) were the first to describe the pili presence on Acinetobacter strains in 1975 in A. baylyi BD4 producing bundle-forming thin pili measuring 2 - 3 nm in diameter. These pili were involved in adherence to biotic and abiotic surfaces. A 6-nm think pilus was associated with twitching motility enabling colonization on adjacent surfaces (29). The current study employed surface antigens as virulence factors. These factors are already described as novel vaccine candidates against MDR A. baumannii (21). Based on the prevalence and amino acid sequence conservation, the antigens could be classified into three groups with Group I antigens suggesting the most likely vaccine candidates (21). The current study results showed that ABAYE2132 (Group I) gene was more common in the strains exhibiting stronger cell adhesion. Presence of this conserved and prevalent gene may be attributed to the virulence of A. baumannii strains. The obtained results were consistent with those of Moriel et al. (21). However, other fimbrial proteins in Groups II and III play a role in adherence and their use in a potential multi-component subunit vaccine cannot be ruled out since they are not highly prevalent or conserved (21). The adhesion of A. baumannii to the epithelium of human alveolar cells was also reported by Gaddy et al. (26), while describing the interaction of A. baumannii with other human respiratory cells. Adherence of CsuE-mutant strain rather than the parental strain to a number of epithelial cells could be attributed to the elevated expression of other surface elements such as different pilus types, as in Escherichia coli (29). The current study findings showed that CsuA was more effective in bacterial adherence to host cells. Dependence on the CsuA/BABCDE-mediated pili in interaction with biotic surfaces in contrast to abiotic surfaces was observed in the studied bacteria (26). Biofilm formation by A. baumannii relies on the biosynthesis of pili; structures assembled through CsuA-BABCDE chaperone-usher secretion system (30). Overall observations in the current study indicated that various cell products and structures of A. baumannii were involved in interaction with biotic surfaces (26). In the current investigation, no significant correlation was observed between virulence factor genes and the antibiotic resistance. The current study results did not show any correlation between antibiotic resistance and cell adherence. In conclusion, the current study findings demonstrated that adherence to human epithelial cells is a general feature of A. baumannii and that ABAYE2132-fimbrial protein, a highly prevalent and conserved antigen, is involved in A. baumannii-biotic surface interaction. Further structural, physiological, and genetic studies are necessary to clarify the role of ABAYE2132-fimbrial protein in the pathogenesis of A. baumannii. Authors wish to thank Shahed University, Tehran, Iran for the financial support of the current study. Funding/Support: The study was financially supported by Shahed University (Grant No. 927584002). The authors are grateful to molecular microbiology research center, and college of basic sciences, Shahed University for granting permission to use the well-equipped laboratories. 1. Smani Y, McConnell MJ, Pachon J. Role of fibronectin in the adhesion of Acinetobacter baumannii to host cells. PLoS One. 2012;7(4). e33073. doi: 10.1371/journal.pone.0033073. [PubMed: 22514602]. [PubMed Central: PMC3326023]. 2. Kim M, Ashida H, Ogawa M, Yoshikawa Y, Mimuro H, Sasakawa C. Bacterial interactions with the host epithelium. Cell Host Microbe. 2010;8(1):20-35. doi: 10.1016/j.chom.2010.06.006. [PubMed: 20638639]. 3. Kline KA, Falker S, Dahlberg S, Normark S, Henriques-Normark B. Bacterial adhesins in host-microbe interactions. Cell Host Microbe. 2009;5(6):580-92. doi: 10.1016/j.chom.2009.05.011. [PubMed: 19527885]. 4. Vijayakumar S, Rajenderan S, Laishram S, Anandan S, Balaji V, Biswas I. Biofilm Formation and Motility Depend on the Nature of the Acinetobacter baumannii Clinical Isolates. Front Public Health. 2016;4:105. doi: 10.3389/fpubh.2016.00105. [PubMed: 27252939]. [PubMed Central: PMC4877508]. 5. Falagas ME, Bliziotis IA, Siempos II. Attributable mortality of Acinetobacter baumannii infections in critically ill patients: a systematic review of matched cohort and case-control studies. Crit Care. 2006;10(2):R48. doi: 10.1186/cc4869. [PubMed: 16563184]. [PubMed Central: PMC1550903]. 6. Neonakis IK, Spandidos DA, Petinaki E. Confronting multidrug-resistant Acinetobacter baumannii: a review. Int J Antimicrob Agents. 2011;37(2):102-9. doi: 10.1016/j.ijantimicag.2010.10.014. [PubMed: 21130607]. 7. Lee CR, Lee JH, Park M, Park KS, Bae IK, Kim YB, et al. Biology of Acinetobacter baumannii: Pathogenesis, Antibiotic Resistance Mechanisms, and Prospective Treatment Options. Front Cell Infect Microbiol. 2017;7:55. doi: 10.3389/fcimb.2017.00055. [PubMed: 28348979]. [PubMed Central: PMC5346588]. 8. Wong D, Nielsen TB, Bonomo RA, Pantapalangkoor P, Luna B, Spellberg B. Clinical and Pathophysiological Overview of Acinetobacter Infections: a Century of Challenges. Clin Microbiol Rev. 2017;30(1):409-47. doi: 10.1128/CMR.00058-16. [PubMed: 27974412]. [PubMed Central: PMC5217799]. 9. Lee HW, Koh YM, Kim J, Lee JC, Lee YC, Seol SY, et al. Capacity of multidrug-resistant clinical isolates of Acinetobacter baumannii to form biofilm and adhere to epithelial cell surfaces. Clin Microbiol Infect. 2008;14(1):49-54. doi: 10.1111/j.1469-0691.2007.01842.x. [PubMed: 18005176]. 10. Smani Y, Docobo-Perez F, McConnell MJ, Pachon J. Acinetobacter baumannii-induced lung cell death: role of inflammation, oxidative stress and cytosolic calcium. Microb Pathog. 2011;50(5):224-32. doi: 10.1016/j.micpath.2011.01.008. [PubMed: 21288481]. 11. Durante-Mangoni E, Zarrilli R. Global spread of drug-resistant Acinetobacter baumannii: molecular epidemiology and management of antimicrobial resistance. Future Microbiol. 2011;6(4):407-22. doi: 10.2217/fmb.11.23. [PubMed: 21526942]. 12. Harding CM, Tracy EN, Carruthers MD, Rather PN, Actis LA, Munson RS Jr. Acinetobacter baumannii strain M2 produces type IV pili which play a role in natural transformation and twitching motility but not surface-associated motility. MBio. 2013;4(4). doi: 10.1128/mBio.00360-13. [PubMed: 23919995]. [PubMed Central: PMC3735195]. 13. Seifert H, Dijkshoorn L, Gerner-Smidt P, Pelzer N, Tjernberg I, Vaneechoutte M. Distribution of Acinetobacter species on human skin: comparison of phenotypic and genotypic identification methods. J Clin Microbiol. 1997;35(11):2819-25. [PubMed: 9350741]. [PubMed Central: PMC230069]. 14. Berlau J, Aucken H, Malnick H, Pitt T. Distribution of Acinetobacter species on skin of healthy humans. Eur J Clin Microbiol Infect Dis. 1999;18(3):179-83. [PubMed: 10357050]. 15. Choi CH, Lee JS, Lee YC, Park TI, Lee JC. Acinetobacter baumannii invades epithelial cells and outer membrane protein A mediates interactions with epithelial cells. BMC Microbiol. 2008;8:216. doi: 10.1186/1471-2180-8-216. [PubMed: 19068136]. [PubMed Central: PMC2615016]. 16. Eijkelkamp BA, Stroeher UH, Hassan KA, Paulsen IT, Brown MH. Comparative analysis of surface-exposed virulence factors of Acinetobacter baumannii. BMC Genomics. 2014;15:1020. doi: 10.1186/1471-2164-15-1020. [PubMed: 25422040]. [PubMed Central: PMC4256060]. 17. Tayabali AF, Nguyen KC, Shwed PS, Crosthwait J, Coleman G, Seligy VL. Comparison of the virulence potential of Acinetobacter strains from clinical and environmental sources. PLoS One. 2012;7(5). e37024. doi: 10.1371/journal.pone.0037024. [PubMed: 22655033]. [PubMed Central: PMC3360037]. 18. Gohl O, Friedrich A, Hoppert M, Averhoff B. The thin pili of Acinetobacter sp. strain BD413 mediate adhesion to biotic and abiotic surfaces. Appl Environ Microbiol. 2006;72(2):1394-401. doi: 10.1128/AEM.72.2.1394-1401.2006. [PubMed: 16461692]. [PubMed Central: PMC1392937]. 19. Tomaras AP, Dorsey CW, Edelmann RE, Actis LA. Attachment to and biofilm formation on abiotic surfaces by Acinetobacter baumannii: involvement of a novel chaperone-usher pili assembly system. Microbiology. 2003;149(Pt 12):3473-84. doi: 10.1099/mic.0.26541-0. [PubMed: 14663080]. 20. Gospodarek E. [Adhesion of Acinetobacter calcoaceticus to cheek epithelial cells]. Med Dosw Mikrobiol. 1994;46(1-2):19-23. [PubMed: 7967922]. 21. Moriel DG, Beatson SA, Wurpel DJ, Lipman J, Nimmo GR, Paterson DL, et al. Identification of novel vaccine candidates against multidrug-resistant Acinetobacter baumannii. PLoS One. 2013;8(10). e77631. doi: 10.1371/journal.pone.0077631. [PubMed: 24116234]. [PubMed Central: PMC3792912]. 22. Chiang MC, Kuo SC, Chen YC, Lee YT, Chen TL, Fung CP. Polymerase chain reaction assay for the detection of Acinetobacter baumannii in endotracheal aspirates from patients in the intensive care unit. J Microbiol Immunol Infect. 2011;44(2):106-10. doi: 10.1016/j.jmii.2010.04.003. [PubMed: 21439512]. 23. Clinical and Laboratory Standards Institute. Performance Standards for Antimicrobial Disk Susceptibility Test: Twenty-fifth Informational Supplement. Wayne, Pennsylvania: Clinical and Laboratory Standards Institute; 2015. 24. Balode A, Punda-Polic V, Dowzicky MJ. Antimicrobial susceptibility of gram-negative and gram-positive bacteria collected from countries in Eastern Europe: results from the Tigecycline Evaluation and Surveillance Trial (T.E.S.T.) 2004-2010. Int J Antimicrob Agents. 2013;41(6):527-35. doi: 10.1016/j.ijantimicag.2013.02.022. [PubMed: 23590898]. 25. Safari M, Mozaffari Nejad AS, Bahador A, Jafari R, Alikhani MY. Prevalence of ESBL and MBL encoding genes in Acinetobacter baumannii strains isolated from patients of intensive care units (ICU). Saudi J Biol Sci. 2015;22(4):424-9. doi: 10.1016/j.sjbs.2015.01.004. [PubMed: 26150748]. [PubMed Central: PMC4486466]. 26. Gaddy JA, Tomaras AP, Actis LA. The Acinetobacter baumannii 19606 OmpA protein plays a role in biofilm formation on abiotic surfaces and in the interaction of this pathogen with eukaryotic cells. Infect Immun. 2009;77(8):3150-60. doi: 10.1128/IAI.00096-09. [PubMed: 19470746]. [PubMed Central: PMC2715673]. 27. Golinska E, van der Linden M, Wiecek G, Mikolajczyk D, Machul A, Samet A, et al. Virulence factors of Streptococcus pyogenes strains from women in peri-labor with invasive infections. Eur J Clin Microbiol Infect Dis. 2016;35(5):747-54. doi: 10.1007/s10096-016-2593-0. [PubMed: 26873375]. [PubMed Central: PMC4840219]. 28. Henrichsen J, Blom J. Correlation between twitching motility and possession of polar fimbriae in Acinetobacter calcoaceticus. Acta Pathol Microbiol Scand B. 1975;83(2):103-15. [PubMed: 1155109]. 29. de Breij A, Gaddy J, van der Meer J, Koning R, Koster A, van den Broek P, et al. CsuA/BABCDE-dependent pili are not involved in the adherence of Acinetobacter baumannii ATCC19606(T) to human airway epithelial cells and their inflammatory response. Res Microbiol. 2009;160(3):213-8. doi: 10.1016/j.resmic.2009.01.002. [PubMed: 19530313]. 30. Luo LM, Wu LJ, Xiao YL, Zhao D, Chen ZX, Kang M, et al. Enhancing pili assembly and biofilm formation in Acinetobacter baumannii ATCC19606 using non-native acyl-homoserine lactones. BMC Microbiol. 2015;15:62. doi: 10.1186/s12866-015-0397-5. [PubMed: 25888221]. [PubMed Central: PMC4381447].